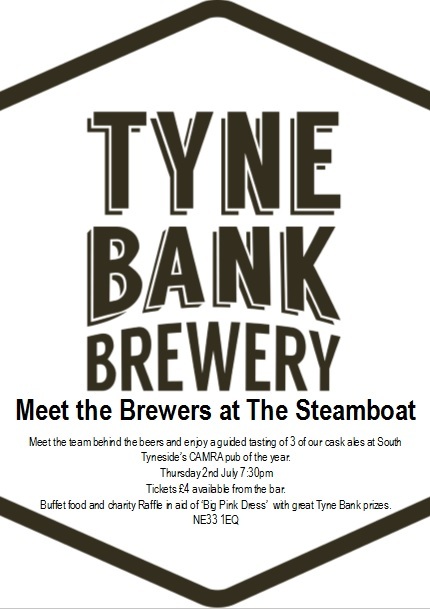 Tyne Bank Brewery: Meet the Brewers at The Steamboat. Meet the Brewers at The Steamboat. Join us on Thursday 2nd July at CAMRA's South Tyneside pub of the year for a meet the brewers and beer tasting session. We will be at The Steamboat in South Shields from 7:30pm hosting a guiding tasting session and talking all things Tyne Bank, including the history of the brewery and an in depth look at three of our cask ales. There will be Buffet food available, and a raffle in aid of 'Big Pink Dress' raising money for Breast Cancer campaigns with some great Tyne Bank prizes. Tickets are £4 and are available from the pub, but the evening is close to selling out so be quick if you'd like to come along. This will be your first chance to sample our July special, alongside classic Tyne Bank ales. We're looking forward to it, see you there.